Native American Facts - Fact 5: History: The introduction of the horse by Europeans resulted in the migration of many tribes to the Great Plains where they led a nomadic lifestyle hunting bison. Native American Facts - Fact 13: Headdresses: Magnificent feather headdresses and war bonnets were worn by the Plains tribes. The significance of a headdress and the brave deeds of the wearer could be judged at a glance from the feathers attached to it. Every feather had a meaning as did the cuts that were made into the feathers. But there were many other types of head gear including crown styles, roach headdresses and even turbans. Native American Facts - Fact 19: Culture: Vision Quests were commonly undertaken by young men as a rite of passage. A Vision Quest was sometimes accompanied by the inducement of a Trance State for the purpose of attaining guidance or knowledge from supernatural forces or spirits. 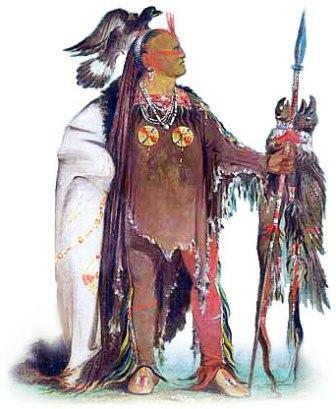 Native American Facts - Fact 20: Culture: The Medicine Man was believed to have a spiritual connection with animals, supernatural creatures and all elements of nature. The Medicine Man conducted ceremonies and rituals when the tribe was facing adversity or needed to obtain solutions to problems afflicting the tribe including sickness.